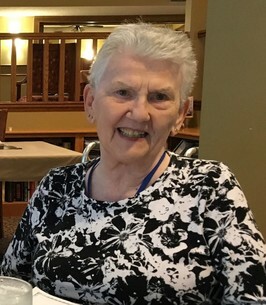 Risacher, Ivona L. age 87 of Bloomington, MN passed away on November 4, 2018. Preceded in death by parents, William and Odelia Hermeling; sisters, Alice Fehring, Lola Voss, Fidelis Hoffman, Betty Haar and brothers, Joseph and Jerome Hermeling. Survived by devoted and loving husband of 65 years, Thomas; children, Michael (Melodie), Steve (Kelly), Mary, Jerome (Kelly) and Laurie (Joe) Marek; 8 grandchildren; 6 great-grandchildren; sisters, Madonna Kramer, May Johnson and Mary Olson brothers, Bill (Shirley) Hermeling; Larry Hermeling and many loving relatives and friends. Mass of Christian Burial November 9, 2018 10 a.m. at Nativity of Mary Catholic Church 9900 Lyndale Ave. So. Bloomington, MN. Visitation 1 hour prior to mass at church. Interment Fort Snelling National Cemetery at a later date; November 30, 2018 at 2:00. In lieu of flowers; memorials preferred to Nativity of Mary Catholic Church in honor of Ivona. To send flowers to the family of Ivona Louise Risacher, please visit our Heartfelt Sympathies Store. We encourage you to share any memorable photos or stories about Ivona. All tributes placed on and purchased through this memorial website will remain on in perpetuity for future generations. My sincere condolences to Steve and the rest of the family during this difficult time. Tom, Laurie, Mary, Steve, Jerry & Mike, my condolences to all of you & your families! Ivona was a dear friend of mine, I have missed her since she & Tom moved back to the cities. She did come up to visit & sat with me at the Cromwell Craft Fair selling raffle tickets to benefit the Tri-Community Food Shelf. She was a breath of fresh air & a valued volunteer at the food shelf. She also enjoyed helping at the Carlton County Operation Community Connect. Words can't express how much she will be missed. Raise a glass of lite beer with ice in her honor! Please accept our heartfelt sympathies for the loss of Ivona. Our thoughts and prayers are with Tom and family.